Readers, to celebrate the spirit of Winter Olympics being held in Sochi, Russia, Norton has organized a promotion wherein they are giving every one a Free license for their "Norton Mobile Security" application for Android Smartphone's and tablets, iPhones and iPads. Norton Mobile Security is a comprehensive protection solution for your Smartphone's and tablets. It not only provides you protection against infection, but also helps to safeguard your data and private information, restoration of lost data and helps to recover your lost or stolen device. No matter where you are when you go online, make sure that your connection is safe and your devices stay protected. 1. Visit this link and then click on the “Proceed” button. You will be taken to the product’s page. 2. Select the 1 year / 1 device option for 29.99$ and click “Buy Now” button. You will be taken to the shopping cart. 3. Enter the coupon “stay_safe_NAM” as shown below, and click “Apply”. You will notice that the order price is reduced to $0. 4. 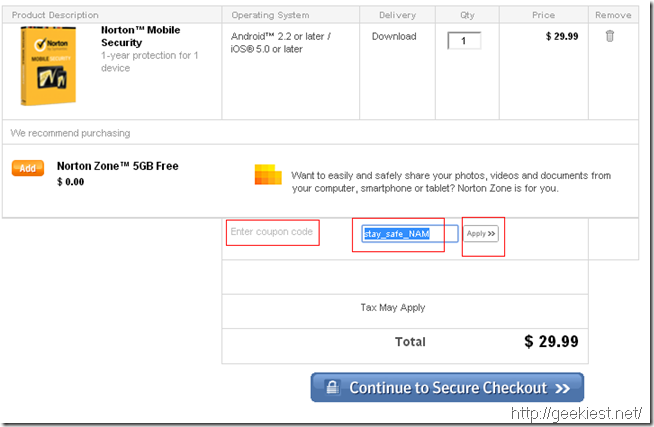 Click on “Continue to Secure Checkout” button, and provide the details as requested. PS-1: This promotion is valid up to the closing ceremony of Sochi games, that is, up to 23 Feb 2014. PS-2: This promotion requires you to provide details of your Credit Card, although you won’t be charged anything. PS-3: Remember to uncheck “automatic renewal” option, to avoid further charges.